Be Brave. Be Bold. Be Creative. 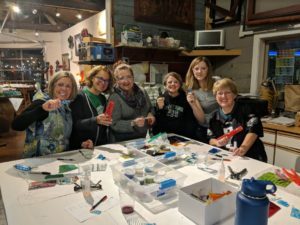 Make art with friends at the beautiful Lisa Stirrett Glass Art Studio. If a class you would like to attend fills up, Call us! We may be able to organize a second class! All of our upcoming Classes and Events! 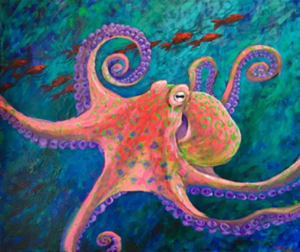 We are hosting an Encaustic Octopus class! Use bee’s wax to build up your Octopus and then use oil sticks and paint with your fingers to bring to life a fun, whimsical octopus! Read My Lips, Mosaic Heart Singles event! Bring your friends, and come to the studio to have some fun. We are making mosaic hearts and will have a “Professional” lip reader! 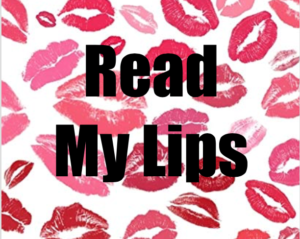 Bring your favorite shade of lipstick and we will be learning what our lip print says about us! Guys are welcome to join in too of course. There will be snacks and refreshments and it will be fantastic evening and you might even meet a sweet heart. You will never see a project like this anywhere else! 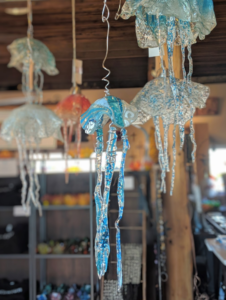 Select from our colorful glass to create the most amazing 3 dimensional glass jelly fish! Call the Studio to sign up! 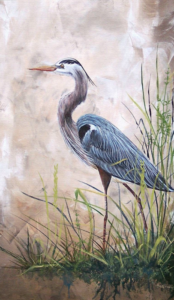 Paint with melted beeswax to create fabulous texture of the heron’s feathers. Inlay paper from Thailand to create whips grasses, and use our oil sticks to finger paint. We have stencils to give you a perfect Heron shape. Of course it is a paint and sip, so we have plenty of snacks and refreshments! This class is right on time for valentines day! 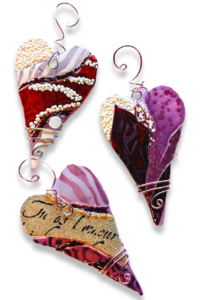 Bring your sweetheart and make a fun Mosaic Heart Ornament! 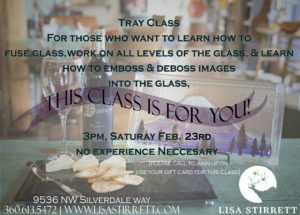 Come join Lisa as she teaches you how to create your very own Glass Tray! This class only comes once a year, and seats fill fast! Who are you a warrior for? We are warriors for empowering women locally and globally, we are warriors for our own personal creativity, and we are are warriors for inspiring life through art. We are holding a talk about the work we are doing in Burkina Faso, West Africa and while we talk and learn together we will be making mosaic tea lights! We would love for you all to join. Paint with Melted Beeswax to build up and carve theses super cute little crabs, they will be crawling off your canvas! Literally! 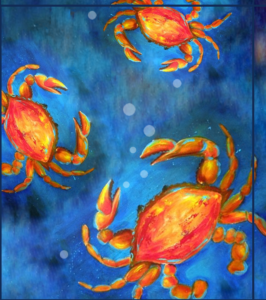 Use our oil sticks to finger paint your crabs with brilliant colors. We are hosting a Mosaic Heart class at Der Blokken and we are buying the first pint of beer! Come and join us! Get some friends together and come on down Bremerton! Eat, drink, and make mosaics! 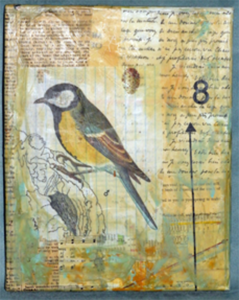 Come join us in our new Encaustic Collage Class! Beginners and Encaustic Veterans are all welcome! 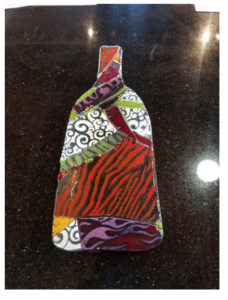 Elephant head, Bull Head, Wine Bottle, or a Bowl? You pick! And create a fantastic mosaic! 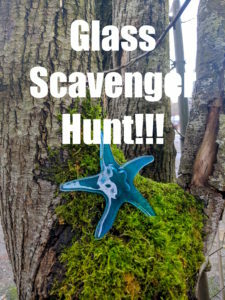 We are hiding glass pieces from Poulsbo to Bremerton! Come in to the studio to get a clues as to where they are hidden across kitsap! Who doesn’t love a little easter egg hunt? 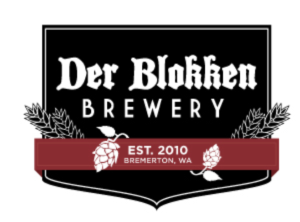 We are hosting a Mosaic Spring Leaf Class at Der Blokken and we are buying the first pint of beer! Come and join us! Get some friends together and come on down Bremerton! They are back! 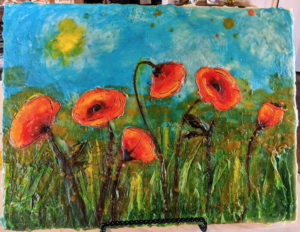 Everybody’s favorite encaustic class the Poppy flowers are here again! build up your beautiful flowers using beeswax, and finger paint with oil sticks! Inlay paper from Thailand to create your grasses and we guarantee everyone will come out with a masterpiece! The Wine Institute Of Silverdale is back and ready to PARTAY! This class is a fan favorite! Create these awesome wine bottle trays that will truly wow any guests when you serve with it. We will have Snacks and Spirits while we have a blast making a mosaic. April Showers bring may flowers! And loooots of green! So we are making mosaic leaves and flowers! 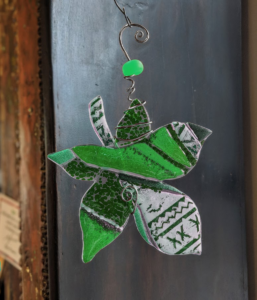 we will wire them up beautifully for you to hang in your window or your fresh blooming garden! *All Sales on Classes are final and non-refundable. If you cannot make it to a class we can work with you to possibly reschedule for you.